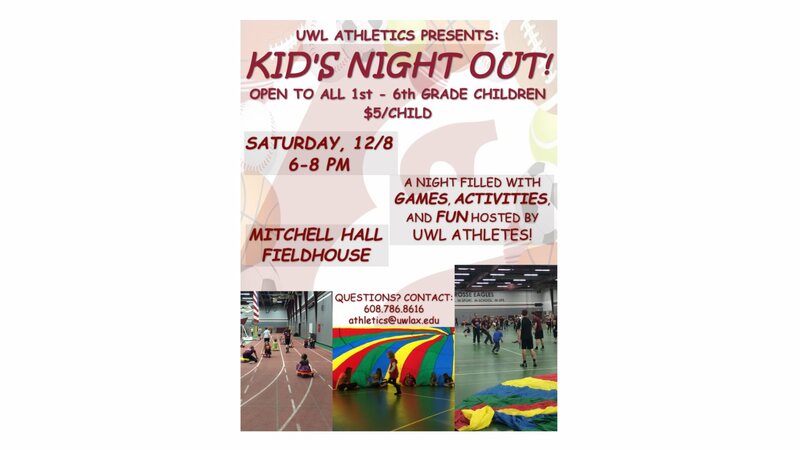 Join UWL Athletics and current Eagle student-athletes for their annual Kids Night Out. Open to all 1st thru 6th graders, kids night out is a night filled with games, activities and fun right here in Mitchell Hall. For just $5.00/child, kids can play for a night and parents can enjoy a few hours on their own. Join us Saturday, December 8th from 6pm to 8pm in Mitchell Hall for Kids Night Out. To request disability accommodations (accessible seating, interpreting, closed captioning, FM systems, etc. ), contact Erin Thacker at ethacker@uwlax.edu or 608.785.5223.